Within 250 miles of Vallejo, CA. Breaststroke is a highly technical stroke that requires a lot of strength, flexibility, and patience. 2016 Olympian Molly Hannis and Academic All-Big Ten and OSU Scholar Athlete Andrew Appleby have mastered the intricacies of breaststroke. Learn drills, exercises, and strategies from this Olympic swimmer to help you find YOUR best breaststroke technique! 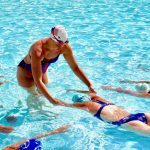 These three sessions are designed for swimmers of all ages and abilitites to improve their knowledge of better breaststroke technique and the variations within breaststroke so that you can find YOUR best stroke. Molly Hannis and andrew Appleby will also teach participants how to carry your momentum through the turn and to blast through your underwater pullouts so that you can breakout ahead of the competition! BREASTSTROKE: Breaststroke is the most challenging stroke to master. The techique in breaststroke requires an efficient pull, a powerful kick, proper timing, and an aggressive attack forward each stroke. Molly will help each participant understand what perfect form feels like and she will also teach them drills and exercises to practice these skills. OPEN TURNS: The open turn is often done incorrectly. Extra movements are added in that slow swimmers down. Keep it simple by spinning backwards and keeping your elbows in close. 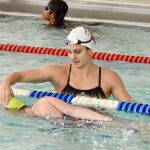 If you listen closely to 200 breaststroke Olympian Molly Hannis, she will show you how she is one of the fastest swimmers in the country through the turn. BREASTSTROKE PULLOUTS: Start out with a strong pushoff in the tightest streamline possible. You do a single powerful dolphin kick and then a strong pull down. Hold your body tight and narrow for a moment before shooting your hands forward and breaking out into your first stroke. Impecable timing is the key to mastering a fast pullout! ASK QUESTIONS: Swimmers and parents are invited to ask Molly and Andrew questions during a Q&A session. Gain insight into her training regimen, diet and nutrition, and recovery tactics. WATCH THE CLINICIAN: Observe Molly Hannis and Andrew Appleby swim at full speed and demonstrate a progression of perfectly executed drills to achieve powerful, efficient and fast swimming. Take a photo while wearing Molly and Andrew's medals, get autographs, and a gift from TYR Sport!